So I'm going to assume most of you are old, retired, and spend all day at home? perhaps you guys need to get out and experience bird keeping by people who have been keeping birds way longer than any of us, through tradition. yes birds are delicate, yes they require attention. But is it difficult? i'd vote no. just effort and love is all it takes. you guys are scaring this guy out of creating a relationship of a lifetime. My main concern with being 18, he/she will eventually move out. If it is truly his/her bird, the bird will go with them. Now most people will not have the money at this age to buy a home... so the only option is to rent. Condos/apartments may have rules against pets and a sun conure is definitely not an apartment bird, but it can work depending on the individual bird. 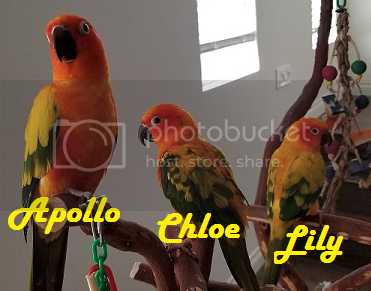 I help out at the local exotic bird store a lot and what I inform parents with younger kids if they do end up getting a bird, choose a bird they would want because most likely when their child goes off to college it will end up being their bird. As Ellen stated, a lot of things can happen in life before one settles down and unfortunately those turn of events may or may not have room for the bird in the new chapter of their life. Last edited by DoubleTake; 05-24-2018 at 02:40 PM. yes that makes sense. that's what my point was before I was attacked haha, making it work one way or another. the real issue is being dedicated 100% to your parrot, not that this person isn't capable of taking care of the bird. Want to talk about offensive? Clearly you don't know what happens when you assume. As a new member, I suggest stepping back and getting to know the very kind members of this forum who give very generously to anyone asking for help, work hard to educate the larger public. The people here are incredibly kindhearted people, some of whom have kept birds for decades, or work at parrot rescues. So "suggestions" such as yours are a bit of an affront. You're entitled to your opinion about how people should keep their birds. However, if you're going to play in the sandbox, understand the sandbox you're playing in. yes that makes sense. that's what my point was before I was attacked haha,. Nobody attacked you. You made a flippant statement - offensive to many here - that could have potentially damaging consequences. which you do sound like you're walking back a bit. it needed to be pointed out and disagreed with. Believe it or not, we are good about disagreeing with out being disagreeable. Last edited by chris-md; 05-24-2018 at 04:10 PM. One thing I have to add in here is, to keep a bird you need an income! So many students forget that owning a bird isn't just buying the bird and cage and it ends there. There are continuous monthly expenses such as toys and food that you need to set aside and make sure you have covered every single month, FOR 20+ years. It adds up -- expect to spend around $50-100 a month on food and toys for a conure. I'm 29 and working full-time! When I was 13 I got a conure and it was the worst decision ever. After 4 years he began to get neglected and was rehomed. If I had found this forum and heard the advice here, I would have waited and been able to spare my Jenday the sub-par care I had given him. We aren't 'sensitive', we all have had past experiences with this topic and most students end up getting too busy and rehoming their birds. We're trying to prevent a situation like that. We just care a lot about the birds! Not "walking back" on anything. I never suggested anything that could cause harm. Neither did OP. he/she seems genuinely interested and determined on a bird and everyone on this thread decided to shut him/her down even after OP showed parrot knowledge. Just think you guys need to chill out a bit instead of telling people not to get birds. better this person on a parrot forum than someone who doesn't bother imo. Very rarely will you find a cuddly IRN, IMHO. Amazing birds, just not usually snuggle bunnies. Sugar, Bless your heart. Stick around, you might learn a thing.